Great value has always been placed on open source at independIT, but in the past year this emphasis has grown even more. The trend is clearly evident. Ever greater numbers of public authorities and major companies are gradually switching to open source software, which increasingly takes them in search of transparent, viable alternatives to proprietary software systems. As developer of the open source solution schedulix job scheduler, we can observe this new orientation towards the open source environment from the number and tendency of the enquiries we receive from prospective customers. To make our scheduling system better known throughout the open source community, in the autumn of 2018 we presented our product at the Open Source Summit in Paris for the very first time. Alongside interesting and promising discussions, we also met the organiser of FOSSASIA, Hong Phuc Dang. Visiting our booth, she gave us a small flyer about FOSSASIA 2019, due to take place in Singapore, and suggested that we exhibit our product there. independIT as a company and schedulix as a product seemed likely to be suitable and an enrichment for the summit. 3000 developers and customers from all over Asia would be gathering at FOSSASIA 2019, which sounded promising. And after our proposed presentation under the title "Scalable IT Workload Automation" was accepted as well, we decided to travel to Singapore, not just to give the presentation, but also to exhibit schedulix. We were surprised and thrilled at the great organisation and communication right from the preparation phase. We received a lot of assistance in both planning the trip, as well as with the preparations for the booth. 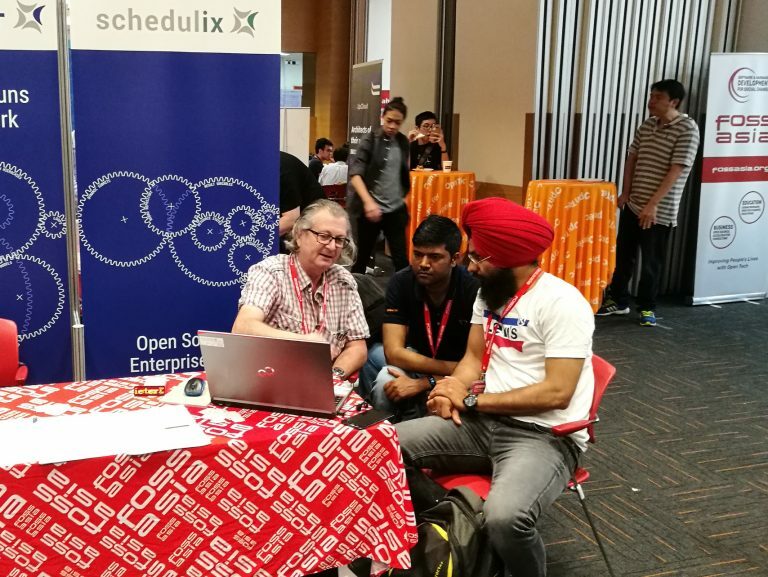 Even before the Summit officially opened, we had the opportunity during a social event in Singapore to meet the FOSSASIA team, together with other speakers and exhibitors. The networking idea, which is what actually powers the open source scene, was practised here with great conviction. And Hong Phuc Dang had not exaggerated with her promises to visitors to the Summit, either. Technology enthusiasts from Singapore, India, Malaysia, Vietnam, the Philippines and Japan occasionally visited our booth in small groups to let Dieter Stubler demonstrate how schedulix functions. We not only established contact with numerous potential customers and partners, but also made many new acquaintances from all over the world. "The Future is Open!" is the slogan of FOSSASIA, and yes â€“ one can indeed look forward to this future. Hopefully we will be there again next year.